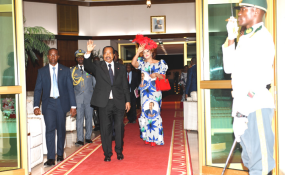 As one would have expected, President Biya thanked the Cameroonian people for renewing their trust in him. In order to state the challenges awaiting his seven years, he made a quick look back at the achievements registered. As nature would have it, the audience was apparently more anxious to know what he has in stock for the Cameroonian people. It was quite a full basket of promises amongst which are: the pursuance of structural reforms to consolidate the country's fiscal balance and bolster debt sustainability, developing the sectors of the economy that could significantly reduce imports of goods and services in a bid to attenuate the negative impact of protectionism that is developing among the World powers, instituting a veritable "agricultural revolution" by modernizing production tools and further processing agricultural products and exploring and exploiting all available sites and rivers in order to transform Cameroon into a major electricity producer in Africa. As far as the Anglophone problem is concerned, the President stated inter alia that he deeply reflected over the frustrations and aspirations of the vast majority of the "compatriots in the North-West and South-West Regions." A good number of these concerns and aspirations, he said, will be "addressed as part of current efforts to accelerate the decentralization process.